Specially designed and crafted by world renowned weaver GABRIELI of Old Jaffa Israel. Each tallit is wool and hand-woven. 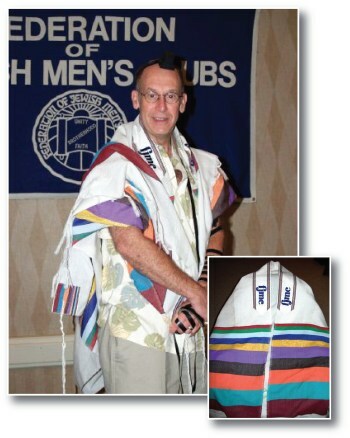 The tallit is a wonderful way to celebrate your involvement in the FJMC. Tallits can ship immediately IF they are in stock, however bear in mind that the Tallit are custom-made and may take between 3 and 4 weeks for delivery from Israel. Please plan your order in advance. There is a $25 charge for shipping within the United States; $45.00 for shipments to Canada, and $70.00 for shipments outside the USA and Canada. * Embroidery for the atarot is done locally by the customer's embroiderer of choice. The FJMC will provide logo specifications. You'll want to display both your FJMC pride and region colors at religious services, whether they be morning minyan, Shabbat or Yom Tovim!